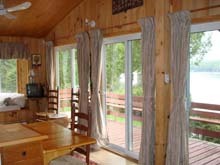 This lakefront vacation property in La Conception, Quebec, is just 30 minutes from Mont Tremblant Ski Resort. Take a long windy driveway over a babbling brook and you arrive at this secluded oasis, surrounded by acres of undeveloped land. This is one of those rare and highly sought after properties, that is flat and right at the water level, with no precarious steps to get down to the lake. Three sets of sliding glass doors are so close to the waters edge, you will feel like you are on a ship. 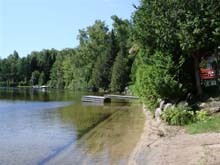 Over 350 feet of lake frontage, the longest private beach on Lac des Trois Montagnes. With a sandy, shallow bottom, with no sudden drops, this lake is very safe and ideal for young children. 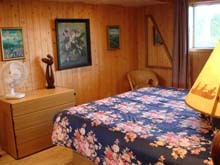 Our vacation property has been recently renovated and is very comfortable, well equipped and tastefully decorated. It is truly a secret four-season treasure. Ideal, of course summer, when you can enjoy exploring the lake from our pedal boat or bring your own motorboat, yes we have a dock. It is also a spectacular place to visit in the spring and fall, when you can enjoy the local hiking trails and see the change of leaves. In the winter, the lake becomes a Wonderland. Make your own ice skating rink or take a half-hour drive on well-maintained roads, to enjoy winter activities at Mont Tremblant Resort. The location is ideal to take best advantage of all nature has to offer in all 4 seasons, that includes the deck and dock in the summer, and great walks along and around the lake in winter. Enjoy a roaring fire after a day of cross-country skiing or snowshoeing in the winter.